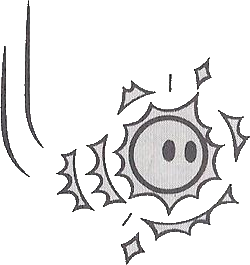 Li'l Sparkies, also called Sparkies, are small sparks that travel along platforms, first appearing in Super Mario World. In later games, they seem to be almost completely replaced by Amps, an unlikely relative with similar traits and behavior. They are also similar to Sparks. The Li'l Sparky (or Lil Sparky) makes its debut in Super Mario World. They have the same immunities as Boos (i.e. invincible to almost everything but Invincible Mario). Additionally, larger ones (referred to as Hotheads) can be found in #6 Wendy's Castle and Bowser's Castle. Li'l Sparkies are found in the e-Reader stages "Swinging Bars of Doom" and "A Sky-High Adventure" in Super Mario Advance 4: Super Mario Bros. 3. Unlike in Super Mario World, they can be defeated by Statue Mario's stomp or by Hammers thrown by Hammer Mario. In Paper Mario, a Li'l Sparky named Watt was imprisoned and tortured by the Big Lantern Ghost. After Mario defeats the Lantern Ghost, Watt joins Mario's party, making her the first playable Li'l Sparky. In Mario & Luigi: Superstar Saga and Mario & Luigi: Superstar Saga + Bowser's Minions, Li'l Sparkies make a small cameo in a pseudo-sidescrolling level to reach a Monty Mole. If Mario or Luigi is attacked by them, he will get knocked back to the beginning. Li'l Sparkies (parsed Lil' Sparkies) enemies return once again in the game Super Princess Peach, appearing in Shriek Mansion and Bowser's Villa, and are invincible to everything Peach can do. Keseran From keseran pasaran, legendary Japanese creature. ↑ Nintendo Mario Mania Player's Guide. Page 146. ↑ Super Mario World credits. Retrieved December 6, 2014. This page was last edited on April 5, 2019, at 21:20.